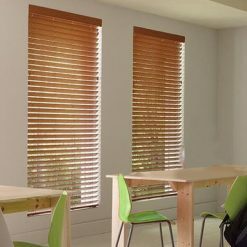 Aluwood is aluminium wood look blinds available in 25mm & 50mm. An alternative to basswood blinds, but more cost affective. It gives an elegant wood look. Used in bathrooms and kitchens where moisture would be a problem for wooden blinds. Ideal where sun is a real problem throughout the day. Get the Best of Both Worlds with Aluwood Blinds! When blind shopping at Blinds Direct, you can have your cake and eat it too! How, you may ask. Well, have you ever imagined having the beautiful appearance of wood blinds combined with the ease, convenience, strength and affordability of aluminium blinds all wrapped up into one mutant blind package? This is no longer a far and distance dream but a very real reality. Please welcome aluwood blinds! All the benefits of aluminium with the appearance of wood? Wood blinds may not be installed in bathrooms and kitchens because the wood is affected by humidity. This is also true when it comes to extreme light and heat. Aluwood is in no way affected by these elements. This makes it perfect for our hot South African summers and even for homes along the coast. 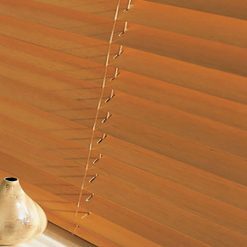 These blinds offer the high-end luxury look of wood for the small budget price tag of aluminium. What a dream! So now there is an option when you adore the aesthetic of wood blinds but can’t afford it.